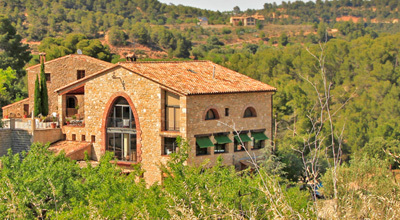 Mas del Cigarrer is a rural complex consisting of three distinctive stone cottages perfectly merged with the landscape, surrounded by forests, vineyards and fruit trees. We are at the foot of the secondary road connecting the villages of Bot and Horta de Sant Joan, halfway between the two. Outside the houses, every space invites you to peacefully enjoy the landscape. In summer, the natural spring at the foot of a magnificent holm oak, surrounded by pine trees, provides a shady oasis, while the swimming pool ensures a refreshing and revitalizing swim. In winter, the sunny front yard allows to enjoy the warmth of the sun. There is a small playground with swings for children and a kitchen garden which supplies the restaurant with fresh vegetables of the season. Rural tourism facilities with accommodation in two cottages: a small house (the “MAS PETIT”) and a larger one (the “MAS NOU”). You may rent a room on bed & breakfast or half board basis (either lunch or dinner), or an entire house (the smaller “MAS PETIT”) to cater for your own meals in the fully equipped kitchen. It may accommodate 4 to 10-12 people. Private swimming pool for clients. Total accommodation capacity (in both houses) for 21 places. Decorated in a rustic style and benefiting from plenty of natural light, it offers great views of the beautiful surrounding landscape. The restaurant is a bright and cosy space, ideal for an unforgettable day out. 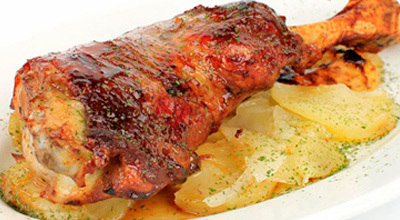 Traditional cuisine with prime-quality ingredients: olive oil and DO Terra Alta wines, fruit and vegetables, honey, lamb and sausages from local suppliers. Seasonal local products. Seasonal dishes: artichokes, mushrooms, escargots, game, etc. Outside area: Ideal to peacefully enjoy the landscape. Natural spring: Water flows under the shadow of a holm oak. Swings: Small playground area with swings for children. Kitchen garden with seasonal products: We grow some of the vegetables used in the restaurant. Wooded area: Pine trees provide a pleasant shadow in summer. Accessibility: Accessible for people with reduced mobility. Wi-fi: In case you don’t want to lose contact with the world. TV: Only in the apartment. Not in the rest of the accommodation . Picnic: We will prepare a picnic lunch to take away upon demand, if you want to go on a long excursion. Pets: Unfortunately pets are not allowed. 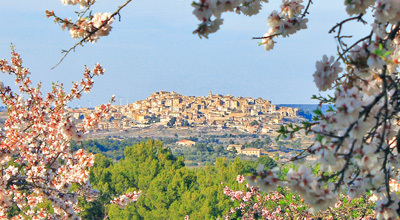 Relax and enjoy nature and culture in the Terra Alta region. 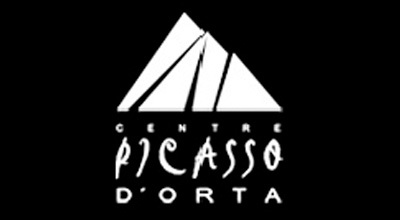 Discover Els Ports Natural Park, bike along the Greenway and see the trace left by Pablo Picasso. 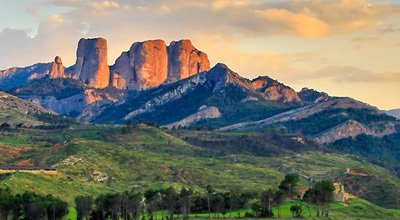 Located halfway between Catalonia, Valencia and Aragon, this steep and rough limestone massif was already inhabited in prehistoric times. And yet the landscape still displays all its wildness and rich fauna. A must for mountain and trekking lovers, the park offers many possibilities in terms of tracks and walks with various levels of difficulty. We will advise you on the most suitable for your needs. The region of Terra Alta is a wild territory south of Catalonia, sprinkled with almond and pine trees, through which a few trains circulated until 1973. That forgotten railway infrastructure takes us today through amazing views around the Pàndols mountain and Els Ports Natural Park. Biking through tunnels and across viaducts we will reach the Ebre river, in Aragon land. 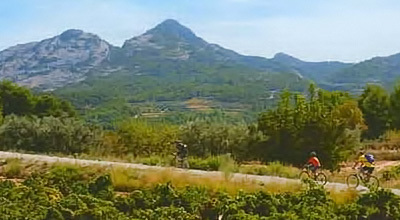 The Greenway section from Horta de Sant Joan to the Ebre (in Xerta) has been considered one of the most beautiful green routes in Spain, in terms of landscape. If you did not take your bikes with you, we can arrange for the renting. And if you don’t want to bike back all the way up, the renting shop offers a pick-up van service.